Let me first say this: a product return isn’t necessarily a bad thing. I say that with confidence…and it’s based on a six-year study from the University of North Carolina’s Flagler Business School. The study was done in 2009, but it’s still groundbreaking today. After all, the school looked at the return rates from various companies. And it turns out that there’s actually a “sweet spot” that equates to higher profits per customer sales. One company was found to have a magic number of 13 percent! That’s why it’s important to know the different reasons for a product return. And we’ve listed the top 10 reasons right here. These are the most common types of product returns. It may seem beyond your control to remedy. But in reality, it’s more controllable than you think. Brick and mortar stores can decrease this product return with knowledge. They need to make sure that staff members are knowledgeable of the products and services. It’ll be great if they also know how to sell different products for different reasons. In the end, product knowledge is great for decreasing product returns and retaining customers. It’s also great to give your customers a chance to test out your product before it leaves the store. So, retailers should encourage customers to try on the shoes if they’re interested. It’s a great opportunity to offer some product knowledge as they try it on for a ‘test run’. A product size may give a big hint to customers. But it can vary from shirt to shirt, and from brand to brand. And it really boils down to the customers’ feel with your product. In other words, if they don’t feel that they’ll wear it in the outside world, they’ll return it. That’s why it’s crucial for them to try it on before they purchase it. And can create an opportunity for you. For instance, customers may also want to try on an outfit that matches the shoes. And vice versa. This will allow you to engage with them, offer some product knowledge, and decrease your return rate. That’s really the end-goal here. But it’s always nice to enhance customer satisfaction along the way. Similarly, online retailers can decrease these returns with excellent, detailed product descriptions. It should include everything a potential customer needs to know prior to purchase. Retailers can offer detailed sizing charts online and instructions on how to correlate them to real-world dimensions. That will help your customers get the right products the first time. Another way to avoid this product return is online product reviews. Encourage your customers to leave comments for future customers. After all, who knows your product better than your past customers and visitors? Consumers trust online reviews just as much as a friend’s personal recommendation. In fact, Shopify found 70 percent of customers check reviews or ratings before making their final purchase. Reviews also add value to your business. It shows that you’re knowledgeable, reliable and attractive to future customers. Is this product description clear and accurate? If not, how can I make it more clear and more accurate? Do I have enough pictures? Do these pictures show this product from different angles? Did I link to a sizing chart? Am I offering the right measurements? Are there any customer reviews? If not, how can I acquire them? This product return happens for several reasons. Some include people buying accessories for an item they broke. They may no longer use or need the product. Or an upgraded product is available, and they want to own that product instead. It can also happen because a customer was forced to move, change jobs or just downsize their personal life. Common products that fall into this category are phone chargers, cases and other accessories. Furthermore, this product return is usually beyond a retailer’s control. But you may be able to convince customers that keeping their current product is a smarter move. This works if you can successfully showcase a benefit of the product. It could be a ‘hidden gem’ that this product exclusively offers that another product does not. There is where knowledge can also help you. Your sales associates should explain the benefits of a customer’s product, and why he should keep it. It may be a cliché to say that ‘[product] knowledge is power’. But you’d be surprised how knowledge can increase your team and company’s job performance. You should let your associates understand the ‘in-n-outs’ of a product. That helps them educate customers and explain any benefits affiliated to the product. Think of this as ‘fun facts’ to offer customers as you keep their interest afloat. You can also set up in-store informative displays. Detailed displays show consumers product information that they should know before a purchase. It also helps your associates whenever they experience a ‘mind-blank’. A display on standby has every single detail about each of your products. But there will be some customers who may dispute the product, rather than return it. That’s why it’s important to know about all the reason codes that issue a chargeback. The Chargeback Reason Code Encyclopedia provides description of each reason code, and tips on how to respond. For example, a card-not-present dispute from a Visa transaction may issue VCR Dispute Reason Code 10.4. The more knowledge about product returns and reason codes, the better. Feel free to receive your copy of the Encyclopedia right here. You need to make an effort into crafting complete, clear (and engaging) product descriptions that answer just about any question a customer might have, especially online. You should also put extra effort into proofreading these same descriptions as well as product images. First impressions are everything online and offline merchants. So it is important to write, edit, re-edit and sometimes change your product descriptions for clearness and accuracy—and engagement. Did you know that approximately 22 percent of returns are due to the product appearance being different than what the website displayed. Product videos and 3D images are becoming more commonly used to help with this return problem. Check and double check that all your product descriptions and images are right and that any supplemental information on sizes, colors, etc., are also given. Your time spent now will save you time, money and customers down the road. Generally, customers buy because they like what they see. If they don’t like, or understand, what they see, they may think that you’re trying to pull the old “bait and switch” technique. A handful of online retailers have essentially built their business on this tactic. 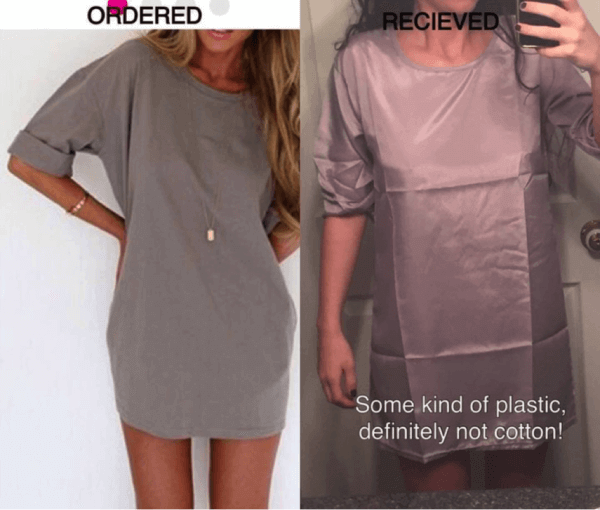 Trendy clothing websites aimed at young adult women use stolen images to sell low-quality merchandise that does not at all resemble the images given. Once again, this can lead them to a path of product returns that can go very, very wrong. Don’t take that path. You probably already know that your products need to represent high quality relative to their price point. This is the best way to ensure customer satisfaction and build a successful brand. If you know your products fit this description but you’re still seeing too many returns, examine your marketing tactics. Perhaps you’re overselling the product, and people just aren’t seeing the value you’re claiming is there. Some companies exaggerate in an effort just to sell products. Don’t be one of those companies. It’s bad business and will come back to bite you in the end. Just ask Sketchers. The company recently had to settle a multi-million dollar lawsuit because their “Shape-Ups” and “Tone-Ups” shoes didn’t actually help people lose weight. A retailer survey showed that 47 percent of respondents said products were returned to their store for not matching customer expectations. Make sure you offer higher quality products and, please, don’t over exaggerate what your products can or will do. One tactic that helps realistically, and confidently, describe your products is to share the story of how the products came to existence. For example, our story of the Chargeback App involves a story of revolution in how chargebacks can be effectively managed internally within a merchant’s unique business model. Feel free to read it here and apply some of the framework to your future marketing tactics. Remember, give customers as much information as you can to bridge the gap between customer expectation and your product in order to avoid these type of returns. Product picking is an extremely important part of the order fulfillment process. And it’s one that can lead to increased returns if it isn’t carried out correctly. To minimize these returns, be sure that your staff is sorting and selecting your products properly. If this isn’t resolved, you are not only losing money on labor hours and shipping costs. Your customers are also not getting the products they ordered. A recent survey found that 57 percent of customers returned products due to retailer error. We’re human. We all make mistakes. But shipping the wrong product or size is one mistake your company just can’t afford to make. Ensure those in your shipping department double check that every item they package is the right product and/or right size being shipped to the right person. Customers often search online for products they normally buy at traditional retailers. It helps them get try to get a better deal on the price and find a better service provider. Or they just simply look online first for convenience (We’ve all been there). If your company isn’t providing an excellent customer service experience throughout the entire online buying process, from pre-sale to checkout, your customers may decide that their tried-and-true retailer is a better option. Provide friendly, helpful communication pre and post purchase. Ship customers exactly what they ordered in a timely manner. Have a reasonable return policy. Allow customers to help themselves by providing a clearly visible search bar on your site and keeping your knowledge base up-to-date. Give a little extra effort. Make customers feel special. Don’t be an average retailer producing average results. Be an extraordinary retailer that successfully retains customers and converts them to evangelists of your brand (Customer reviews, social media tagging, etc.). Need a little help there? Checkout our Customer Service Guide and download a free Customer Service Policy template. Similarly, customers will often explore the varied products offered by their go-to retailer. It’s your job as a smart retailer to help your customers step out of their comfort zone. But at the same time, you must keep them from buying something you know they won’t like. To avoid returns resulting from this scenario, recommend your best customer’s alternative or complementary products that go with those they’ve already purchased. That way, they don’t have to experiment with unfamiliar products on their own. Also, publish customer reviews and product ratings as well as product comparisons when applicable. Think of them as testimonials that keep growing, thanks to the customer’s satisfaction and your customer service. Customers trust their fellow shoppers. They benefit from their peers’ experiences when reviews and ratings are available to them. Product comparisons also help inform customers about products they’re unfamiliar with. Just like with a good pro-con list, comparing the details about one product with another similar one educates customers about the important details before making a purchasing decision. This helps know everything about the product and reduce their need to return it. Sadly, as return trends show, most of us just don’t know what other people like. Gifts purchased during the holiday season are some of the most returned products across the board. You can try to narrow your product focus and draw your shoppers to appropriate products. But doing so will likely cut into your bottom line. Furthermore, gift card scams are another increasing concern that needs to be addressed (Luckily, we offer a free white paper on how to prevent gift card fraud and scams). Giving the perfect gift is hard. If you notice a customer struggling to decide between two items, or who can’t choose which color of shirt they think their mom will like best, here’s your solution to reduce returns—consumer research. You’ll be surprised what you can learn from your customers even with an 8-question survey. We did that last year in order to understand why consumers actively participate in a returns process (You can find our results here). Wardrobing is a specific type of consumer fraud, where a customer buys an item and uses it for a one-time purpose with the intent of returning it. For instance, a customer might buy a new TV just to watch the Super Bowl, only to return it once the party’s over. And they expect a full refund, as if their intent couldn’t be more malicious. There’s not a whole lot you can do to discourage these types of fraudsters without penalizing your “good” customers. For example, a stricter return policy may restrict this activity. But that can backfire if there it is not outlined in great detail. You can implement a shorter return timeframe and state what products, and scenarios, can justify an acceptable return. Also, and make sure your return policy is included on each receipt. However, if this type of product return is too severe, feel free to create a “habitual offender” list to minimize the impact of these types of returns. That will help safeguard your business’s bottom line. Another tactic is to simply stand your ground. More often than not, it’s pretty easy to tell if an item has been used, i.e. wrinkled, stained, broken seal, etc. Give the item a good look over. And if you can tell it’s been used, it’s totally OK to tell the customer you can’t accept the merchandise because it’s been used and is no longer re-sellable. They may argue with you and try and cause a scene. But stay strong and stick to your [revised] return policy that doesn’t allow wardrobing. Criminal fraud contributes to excessive returns. This type of product return usually involves purchasing items with counterfeit money or stolen credit or debit cards. The fraudster will then return the product for a refund in order to take your cash (Along with ruining a cardholder’s transactional history). Criminal fraud also involves stolen merchandise. According to an NRF survey, nearly 92 percent of retailers have experienced a thief returning items for cash that they’ve stolen. Deliberate fraud is a type of money laundering that can only be stopped with adequate fraud prevention at the point of sale. This is critical, as these types of fraud cost retailers an estimated $16 billion per year. Invest in a good POS system. Charge a restocking fee for any return or for your more expensive products. All accounted for, returns aren’t a terribly big deal. It’s estimated that for every dollar spent on merchandise, just nine cents is returned. Sure, that’s close to 10 percent. But most retailers are doing a good job wrangling the cost of returns, especially when you account for the “good returns” (those responsible for actually increasing profits). Whatever path you choose, a solid return policy, combined with above and beyond customer service, is not only a good customer service tool–it’s a money saver as well. Make sure yours is crafted to protect your legitimate customers, as well as your bottom line. Could you elaborate on how the “Good Returns” are responsible for increasing profits?